Our outdoor pavilion was built in 1990 by our members and provided us a facility to entertain Veterans from both Castle Point and Montrose VA Hospitals, in addition to other local community events. Our Bar Room has been recently renovated in oak paneling. All of the work was done by Volunteer Members. Our Fun & Games Chairman Steve McGirr was named Elk of the Year for 2008/09. 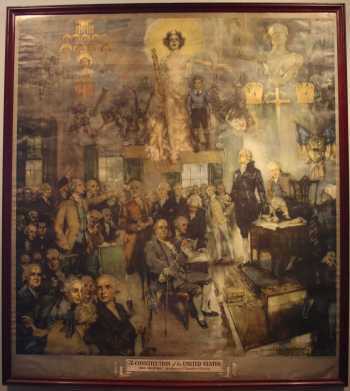 Many framed prints hang around the Bar area, including this Lithograph from the Sesquicential celebration of the signing of the Constitutin. It is called "The signing" and was painted by Howard Chandler Christy and was issued in 1937. 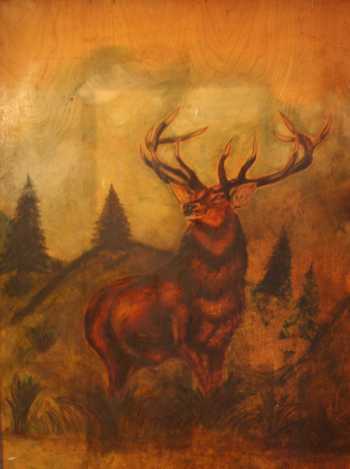 The door to the room has an Elk painted on both sides by Ilona O'Connor, the wife of PDD Peter J. O'Connor. 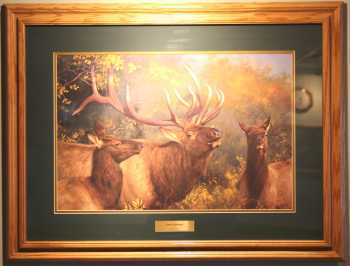 A Limited Edition Print by Bruce Miller called "Winter Call" with a First Day Issue stamp "American Elk" from 1987. 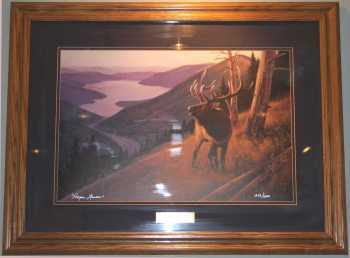 A Limited edition print by Hayden Lambson called "Above Camp". Another Limited Edition print by Hayden Lambson called "Ivory Challenge". A frosted mirror depicting Elk. 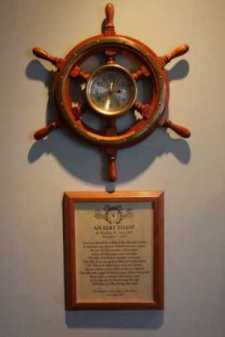 A Ships Wheel clock hangs above an Elks Toast written by PER Matthew Veth, in honor of Our Absent Members. 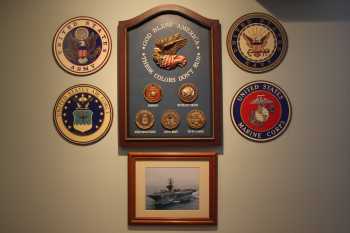 Our Veterans Corner - A work in progress. 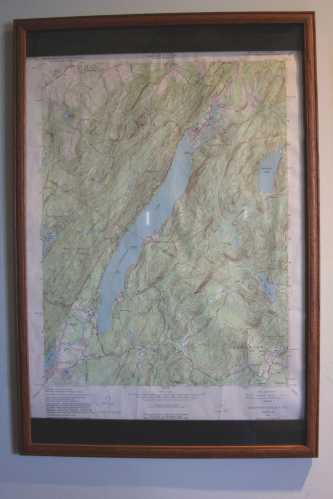 A Geologic Survey map of the area. 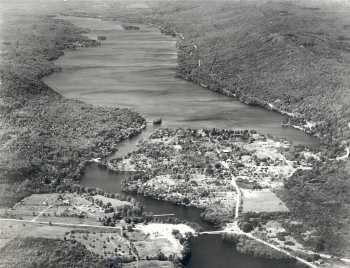 A Bi-Plane aerial view of Greenwood Lake looking south towards New Jersey, taken in 1934. 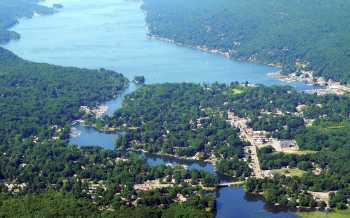 The Village of Greenwood Lake as it is today, in the spring. The Village in the early Fall. 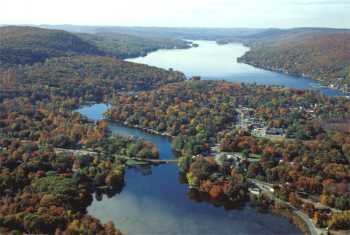 The Appalachian Trail passes alongside the Lake. 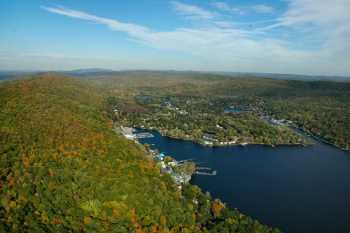 This view is looking north on the west side of the Lake.